Name: The Royal Ceremonial Emblem on the 60th Anniversary of His Majesty the King's Accession to the Throne, 9th June 2006. Definition: The Royal Ceremonial Emblem on the 60th Anniversary of His Majesty the King's Accession to the Throne. There are soft yellow on the Thai letters Bhor Por Ror. The yellow color of the letters is the color of His Majesty's day of birth and a gold color has been a line around with mixing between blue and gold background. Also there are diamonds around that mean a man of learning, poet laureate and famous craftsman. Therefore king seems to be one diamond of Thai people that mean the top of precious stone. His Majesty the King's initials, placed under the Royal Crown There are 5 symbols, a crown, a chaisri royal sword, a king’s walking stick, his fan, his shoes that mean Anniversary of His Majesty the King's Accession to the Throne, below The Royal Ceremonial Emblem on the 60th Anniversary of His Majesty the King's Accession have been on pink silk and on the right has a monkey, on the left has a garuda in the end of it. 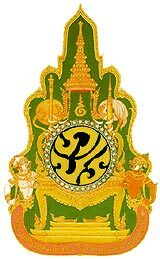 All of The Royal Ceremonial Emblems have to be mixing between green and gold color that mean power and fertile.